Have you ever wanted to be on a game show? Would you like to win some money without ever having to leave your couch? Well this is your chance at making your dreams come true. 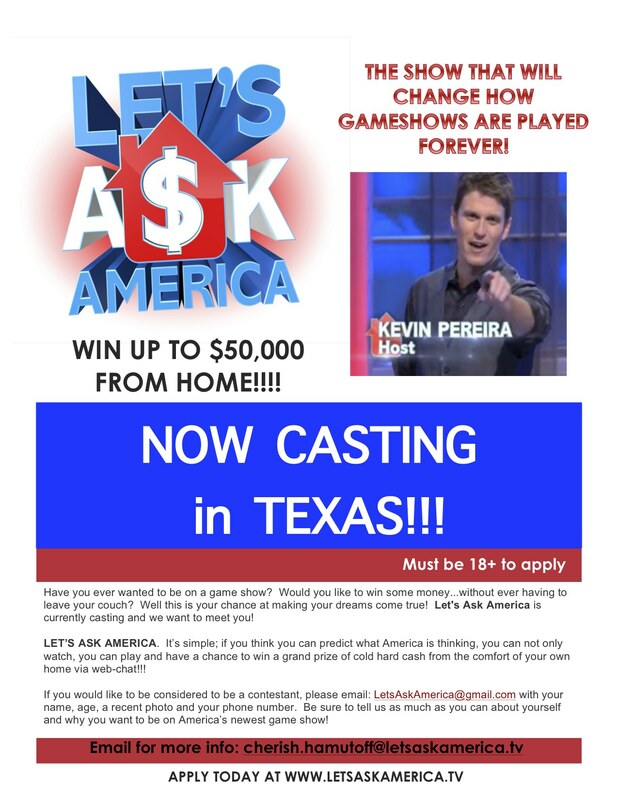 Let’s Ask America is a brand new game show currently casting contestants and we want to meet you! It’s simple; if you think you can predict what America is thinking, you can not only watch, you can play and have a chance to win cold hard cash from the comfort of your own home via web-chat!!! How does the show work? Every day four contestants will be chosen to play the game and win cash via web-chat from their home. The game is simple; we poll America to find out what they are thinking. Then all the contestant has to do is correctly predict the answer to win! If you have always dreamed of being on a game show or could use some extra cash to pay the bills or finally plan that family vacation, apply today! A short paragraph about who you are! Contestants must be 18+ to apply.